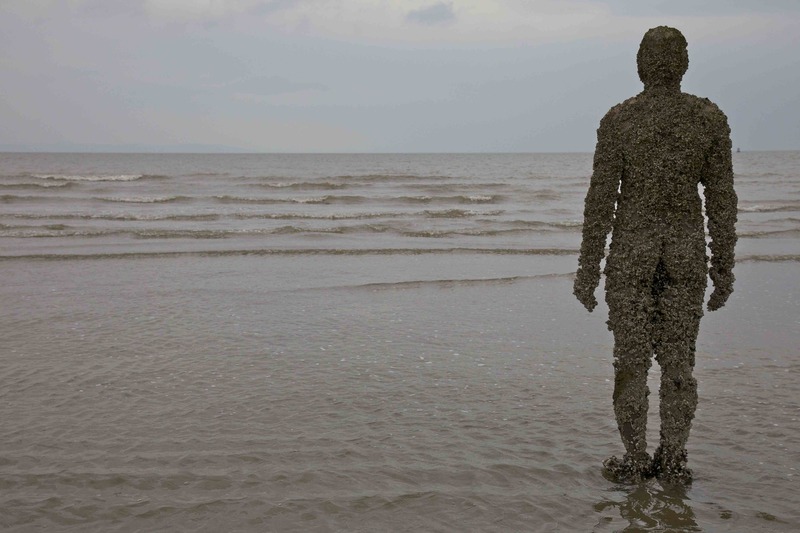 Another Place is a seaside sculpture by the British artist Anthony Gormley. 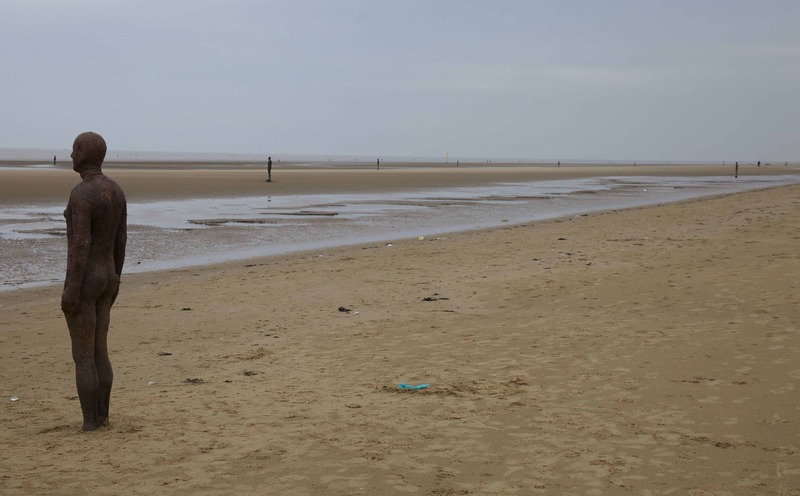 It consists of 100 cast-iron replicas of the artist’s body arranged over a 2-mile stretch of beach near Crosby north of Liverpool. Originally made in 1997 for exhibition on a beach in Germany, the sculpture travelled from there to Norway, Belgium and finally Britain where, after much local debate, it was decided to keep the sculpture permanently. 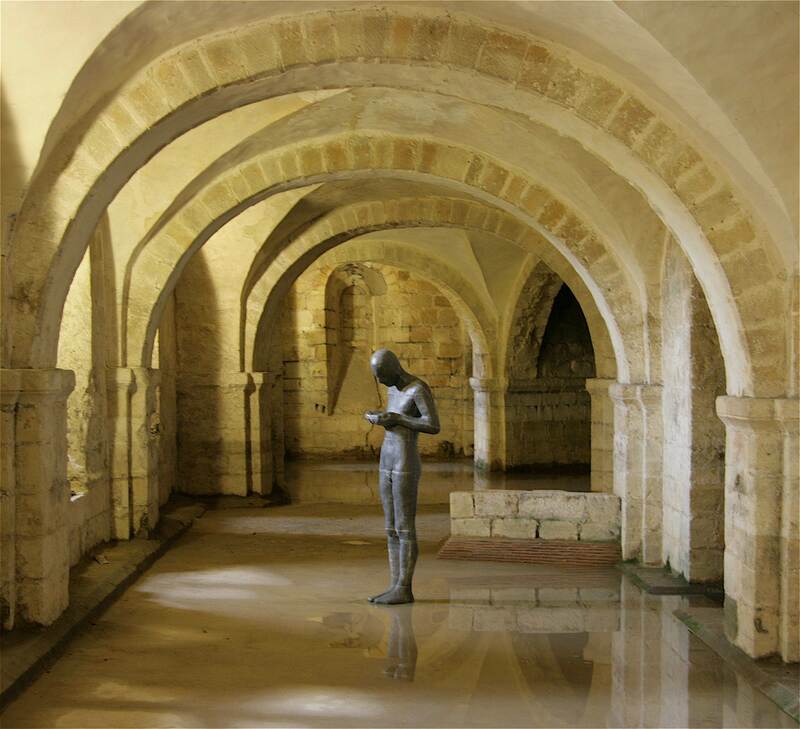 Cast iron is a material Gormley uses on a regular basis – and casts of his body appear in such diverse locations as the crypt in Winchester Cathedral (1) and on the tops of various buildings in London, as part of his 2007 exhibition at the Hayward Gallery (2). 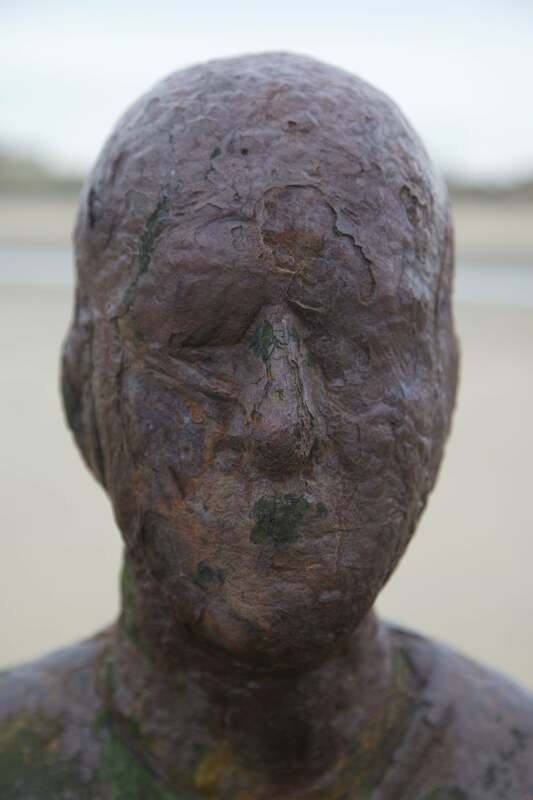 In making multiple replicas of his own body, Gormley invites questions about the production of art, the mechanisation of the human body, and how the reproduction of art affects our consciousness of it. 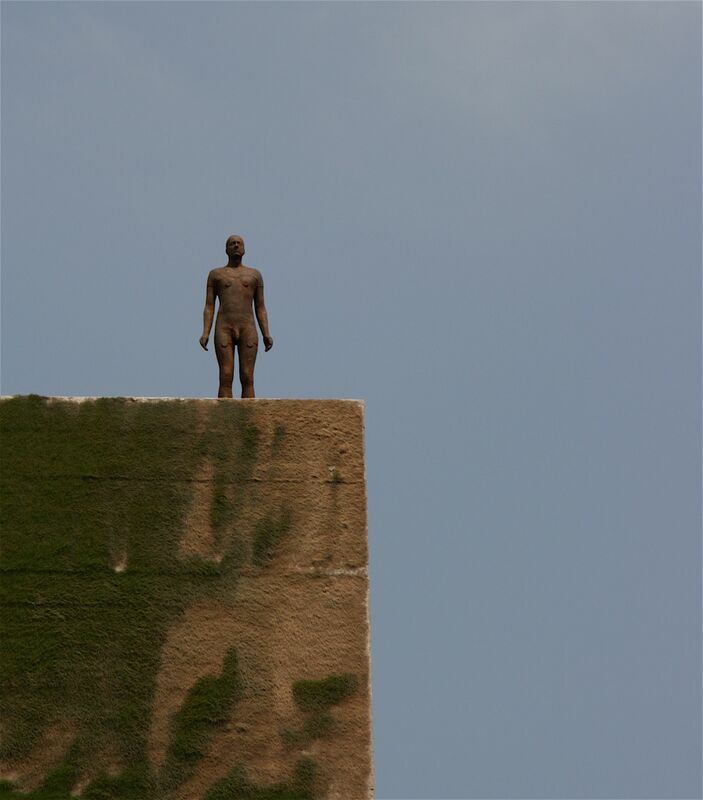 In addition, in his use of cast iron, Gormley harks back to an earlier era of industrialisation and the location of works like Another Place and The Angel of the North in former centres of industry reinforce these connections. In Another Place these connections are further strengthened by cast iron’s relationship with the British seaside. In many of Britain’s seaside resorts, cast iron was formative in the transformation of sites defined by wild nature into artificial environments, in that it provided the raw material for both structures (piers, pavilions and shelters) and ornamental utilities (lamps, railings, toilets and kiosks). Today, much of this Victorian ironwork remains but now, in its state of rusting decay, a melancholic reminder of the slow decline of British seaside resorts from their heyday in the early twentieth century. 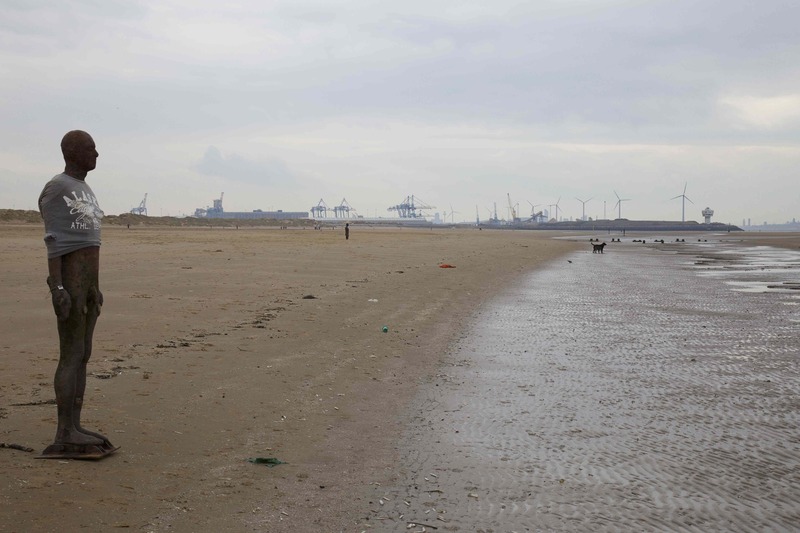 Gormley’s sculptures fill a relatively undeveloped stretch of coastline north of Liverpool, away from the Victorian resorts of Southport or New Brighton. All the figures face the same way – out to sea – and they are arranged in lines stretching from the high- to low-water tide lines. What is striking about the figures is their varying degrees of naturalisation. In only a few years, some of the figures are almost completely covered in barnacles or seaweed (3); others are rusted with golden patterns (4); some seem almost as new; others have even been given clothes to cover up their nakedness (5). Where Victorian cast iron in nearby Southport is being repainted to keep rust at bay, here the iron is deliberately exposed to the violent natural forces of wind, sea, sand and salt. The result is a sense of positive value given to both artifice and nature and the relationship between the two, which here assumes a highly individual character despite the original figures being exact replicas. Here, Gormley perhaps offers, in these cast iron figures, a metaphor of ourselves being both similar to each other but also made unique by our individual trajectories in life.